UFC 236 is now in the books! Let’s take a look back at this great card in the order the fights occurred to get a sense of what took place and what’s next for the combatants of the UFC’s ESPN+ pay-per-view debut! Had this fight occurred on a fight night or maybe even a lesser PPV, it would have likely won or shared Fight of the Night honors. Great scrap. Costa will be back and, with this victory, Davis ensures that he will be as well. If this were a five-round fight, I think Mueller takes it. If Botelho can work on her gas tank, she has what it takes to potentially be a top-five strawweight. I’d like to see Jackson get a big step up in competition for his next fight. He’s a legitimate prospect for the division and I’m eager to get a better grasp of his ceiling. My initial read of him so far is that while he has the tools and well-rounded skill set to shake things up, and at 26, plenty of time to do it, he seems a little bit too lax. In some respects, his personality comes across in the cage: very laid back. This can be a good thing, too, of course, because it means he’s composed, calm, and steady. But there’s times when I feel as though he should be more aggressive and display more of a killer instinct. Some of that may have to do with comfort in the Octagon which will grow in experience. Time will tell. Soukhamthath is now 2-4 in the UFC. He could be out of the door with his next loss or maybe even after this one. Pretty swift fall for Curtis Millender who has now lost twice in a row in somewhat similar fashion. The book is out on how to beat him and it’s up to the UFC’s matchmakers on how much he will continue to plummet. If they put him up against another above average grappler next, the result could be the same and Millender’s UFC future could suddenly become in question. If they match him like they’ve been matching Rountree, on the other hand, then that should buy him some time to round out his skill set. Muhammad has a 6-3 UFC record now. I get the feeling Muhammad is going to be a journeyman in the UFC for years to come, similar to a Tim Means. I thought the stoppage was early. Salmon’s right hand went up in what appeared to me to be an intelligent/attentional attempt to block punches, but he did that at the exact same time the ref jumped in. I can see where the ref was coming from because it definitely looked like Taha was about to continue landing punches. I myself am in the “definitive outcome” camp and would like to be sure. This doesn’t have to necessarily contradict the “protect the fighter” camp. Seeing as how quickly Salmon shot up, I’m not sure how anybody, commentators included, can pretend it was 100% definitive. The Adesanya/Gastelum fight could have also been stopped in the fifth and I feel confident in saying that Goddard let it continue because of the stakes and he believed Gastelum deserved a definitive outcome, especially given how late in the fight it was. The problem with this exceptions approach is you do not have the right to tell Salmon how important the fight is to him. Just because there is a title at stake for Gastleum/Adesanya does not mean that in Salmon’s mind each fight (especially his UFC debut) is not the same value as a title fight TO HIM. In any event, Taha still exceeded expectations on my end by dropping the decorated boxer. Hats off to him for the victory. Imadeev is a pretty exciting fighter. I’d love to see him pitted against a banger in his next outing. As for Griffin, I think this was a must win for him. This is the second fight in a row where he looked absolutely spent at the end, though. The guy is 33 so the cliché line of “He needs to work on his cardio” doesn’t seem to apply. At this point it is what it is, and it’s one of the things that will prevent him from ever being a ranked fighter IMO. Didn’t expect the fight going this way. I was expecting a grappling match. Reis hasn’t been the same since losing to Demetrious Johnson. Whether it’s because he lost motivation or not, I do not know. And he hasn’t just lost, but he’s lost four of his last five fights now, each of which either being stoppages or unanimous decisions. The way the UFC are cutting flyweights, I’d be surprised if they kept him around. Hats off to Pantoja. Pantoja vs. Figueiredo is the fight to make next. Jalin Turner has potential but he’s just too green. He’s now 8-5 and 1-2 in the UFC (Although one loss was to Vicente Luque on short notice). The kid is only 23 years old, so if I’m in one of the major camps, I’d love to take a guy like this under my wing without necessarily rupturing any of his current ties. I’m not sure Frevola’s stock rose with this performance, but a win is a win. I enjoyed this fight. Saint Preux didn’t look like himself standing up. His standup skills have diminished, but his grappling has advanced in its place. At least somebody at UFC 236 was able to get some redemption, with Krylov avenging his loss to Saint Preux years ago. Krylov’s striking looked very crisp and he seemed to arouse panic in Saint Preux, which I was not expecting. Kyrlov is now about to be ranked, and I’d like to see him face the winner of Glover Teixera and Ion Cutelaba. Dwight Grant definitely has KO power, but if he doesn’t knock you out, I think it’s clear that his style is primarily to evade and threaten.. I expected Grant to fight how he did, but what I didn’t expect was for Jouban to let him. He’s usually pretty aggressive. And even when he gets rocked, he doesn’t give up or change his style. That’s what I was banking on. If I were a judge, I would have scored it for Jouban mostly because of Octagon control, and I’m not one to let a fighter game the system, I.E. Jack Marshmann/John Phillips, but I can understand giving it to Grant if I’m being objective. I’ve long since believed Eryk Anders was overrated, but I did think he’d win this fight. I thought he’d choose not to stand with Rountree and wrestle with him or at least clinch with him. Had you told me he’d just flat-out stand with Rountree, my prediction definitely would have looked a lot different. Rountree is a fun fighter, and these wins assure that he’ll stick around. But the fact that he didn’t want to ground-and-pound a very rocked Eryk Anders tells me that he still has no confidence in his ground game. It’s not as if Anders is Demian Maia down there. So Rountree to me is still another Curtis Millender but with even better striking. Fight of the year so far and one of the best fights of all time without a doubt. The fight was a star-maker indeed and a hype verifier. There are different ways to verify hype. One way is to simply keep winning, especially in dominant performances. Another way is to demonstrate that you have the heart and warrior spirit to match the technique and skills that put you on this stage. Kelvin Gastelum had an opportunity to snuff the hype in the fourth round. He landed a head kicked that badly rocked Adesanya and had him backed against the cage. It is at this time that Gastelum opted to do a rattle-and-grapple. Usually a mistake, a rattle-and-grapple is when you have someone rattled and, instead of going for the kill, you opt to grapple. Whether he would have put Adesanya away right there, I have no idea. But Gastelum owed it to himself to find out. Now, he will be forced to always wonder what if while Adesanya and the MMA history books simply carry on. Adesanya showed good takedown defense, great mat awareness and defense, whether getting back up or threatening submissions. I thought for sure he had the fight won with the triangle attempt. Adesanya revealed in the post-fight presser that he had a minor knee injury leading into the fight, which prevented him from keeping the triangle in. So Adesanya was able to display heart, will, takedown defense, and a ground game. It will be hard for naysayers to find something to pick at, but of course that’s part of mass discussions and social media. I’m sure people will find something. It’s not as if it would be impossible to do so. It goes without saying that the fight was far from a flawless victory and that there weren’t tons of holes to be excavated. But from where I’m sitting, he answered far more questions than there will be potential criticisms. Adesanya/Whittaker will be huge and has all the makings for another potential classic. As for Gastelum, I’d like to see him face the winner of Romero/Costa next, assuming that fight finally happens. Weidman is an opportunist so he might get in where he fits in, but I’d rather him face the winner of Cannonier/Silva or the winner of Elias Theodrou/Brunson. 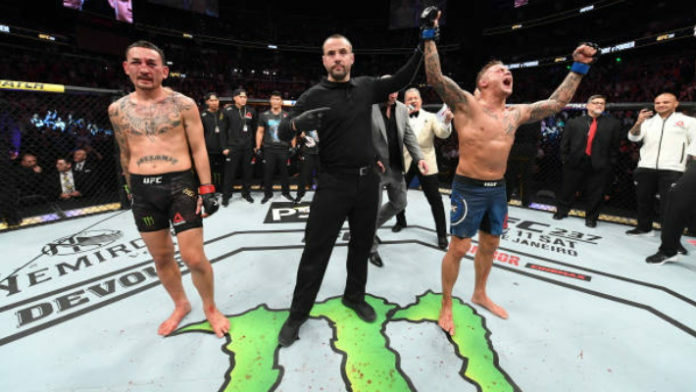 I don’t know whether to feel heartbroken that we’ll never see Ferguson vs. Holloway in its full potential or just accept that Poirier is the man who seized the opportunity and has earned it every bit as much as if not more than Ferguson. But I’m not even sure if the Ferguson/Holloway fight could have happened even if Ferguson had accepted in light of recent events, but I can’t help but feel that it should have been Ferguson/Holloway, streak vs. streak, with the winner going on to face Khabib in an even bigger streak vs. streak fight. It just seemed so perfect. But one thing I’ve learned from MMA is that perfect scenarios almost never play out. One great exception to that is being able to see McGregor vs. Khabib in their primes. But sadly, I doubt we’ll ever see Ferguson vs. Khabib in their primes with the same streak vs. streak hype that was meant to happen. I truly hope I’m wrong. As for the fight, Dustin Poirier did what I thought he’d do: outpower Holloway. Holloway is very hittable and his power and aggression was not going to be the same against a dog like Poirier. It’s not just about moving up in weight. It’s about moving up in weight against a verified scrapper who is hungry and not going to get bullied. Max Holloway is a great fighter who has proven me and many doubters wrong time and time again, but the man is very beatable. I wouldn’t go as far as to say he’s overrated because you don’t just win 13 fights in a row by chance. But I do think he was overestimated coming into this fight relative to how the majority made him out to be. Label that what you will. I’ll tell you what though, he’s every bit as tough as I thought he was and he’s a true warrior with the will of a champion, which is one of the reasons he is such a dominant one. Great fight by both men. The only way this fight was not going to be great is if one of the two men were put away early. As long as that didn’t happen, it was almost a shoo-in for Fight of the Night, which it shared with the unbelievable co-main event. Max Holloway should return to 145 (which should be a foregone conclusion), at which point his winning streak in that division will probably continue. As for Dustin Poirier, hats off to him for this moment. One thing I love about interim titles is that it gives people an opportunity to feel what it’s like to be a champion, even if they might not necessarily ever become an official champion. If you watch Tony Ferguson’s reaction after beating Kevin Lee and watch Poirier’s reaction after defeating Holloway, (and many other interim champions before them, including the co-main event on this card), it’s apparent that regardless of what outsiders say, the interim strap does mean something to the fighters. And it’s good for them because, at the risk of sounding harsh, as long as a fighter the caliber of Khabib Nurmagomedov is at the helm, I highly doubt they’ll know what it’s like to be an official champion, so it’s good that they were able to have these moments in the interim (no pun intended), prior to coming face to face with that reality. I expect Khabib to cruise to a victory against Dustin Poirier. But for now, we’ll have to wait to find out. And as we’re waiting, Dustin Poirier can soak in the afterglow of what it feels like to be a champion. Be sure to stick with MMANews.com for more from the aftermath of UFC 236 as well as all the other daily news!